Anguilla is located in the British West Indies, in the eastern Caribbean, about an hour east of Puerto Rico by air and 7 minutes north of St. Maarten by air or twenty minutes by boat. Winair (1-866-466-0410) offers scheduled daily service between Anguilla and St. Maarten. Private charters can also be arranged with Anguilla Air Services (264-498-5822). Ferries are a popular way to travel between Anguilla and St. Martin. Between 7:30AM and 7:00PM, ferries run at approximately 45-minute intervals between Blowing Point, Anguilla and Marigot Bay, St. Martin every day. No reservations are necessary. Ferry crossings are $15 each way, plus $5 departure tax. Last ferry of the day is at 6:15 p.m from Anguilla and at 7:00 p.m from St. Martin. Ferries are also available for charter. There are several options for transfers to Anguilla from Princess Juliana Airport in St. Maarten. A 25-minute boat ride departs from the nearby lagoon at Princess Juliana Airport and disembarks at the Blowing Point Ferry Port in Anguilla. 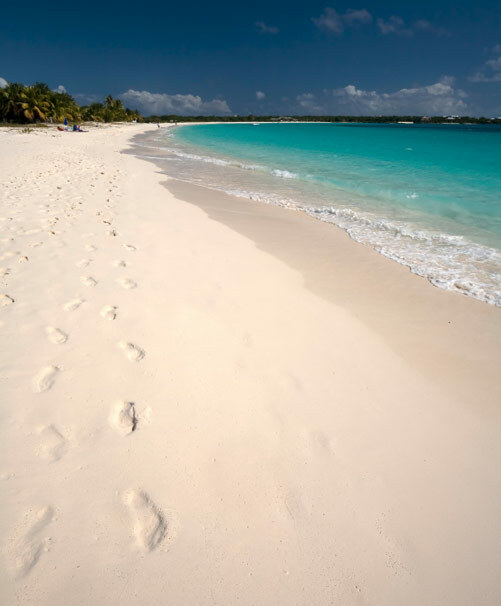 Guests must first clear Immigration and Customs in St. Maarten and then proceed to Anguilla. Maximum 12 persons per private charter. A valid passport (with at least 6 months before expiration) is required by all visitors to Anguilla. Visitors are required to have a return or onward ticket. Additionally, citizens of certain countries will also need entry visas. Green card holders must have a valid green card and valid passport from their country of origin.